May 04, 2016 We're terribly sorry to hear the product did not work for you. We formulated the product in conjunction with a world renowned Doctor based a significant amount of clinical studies. While the studies show many people will experience results in as little as 7 days, unfortunately some will not. We're sorry that this was the case for you. Our records do show your account was canceled, we received your return, and you were issued a full refund for your return. 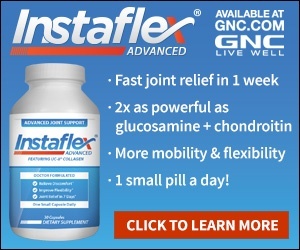 I have bad hip joint pain, so when I saw the ad for Instaflex Advanced stating, "Relives Discomfort" "Improve Flexibility" "Joint Relief" in 7 Days" I decided to try it. The first day I took a pill, the joint pain was worse, the second day it was even worse and the third day I almost could not move. After that it slowly went back to the pain I had before I had taken Instaflex. I continued to take the pill for 8 days, but no improvement. I decided not to continue it. That same day I received a bottle of Instaflex. Eight days, not even the two weeks. I did not open the package, marked it REFUSED and RETURN TO SENDER, but Instaflex still billed me and has not given me a refund. So what do I do now? Reason of review: sent product without an order..
Review #783249 is a subjective opinion of User783249.